One of the most anticipated events of Vancouver’s summer season hits a milestone this year: The Deighton Cup will return for its 10th anniversary on Saturday, July 21 at the Hastings Racecourse from 12pm to 8pm. Back in 2008, Vancouver was at its peak of “No Fun City.” Clubs and live music venues were shutting down almost weekly, the Plaza of Nations lost its glass roof and ability to host public events, and nightlife was limited to the dubious oﬀerings on the Granville Strip. fun. Their first collaboration was to bring the thrill and glamour of summer derby racing to Hastings Racecourse. And so, The Deighton Cup was born, growing from a few hundred attendees outfitted in their best, to last year’s record of 6,000 people. 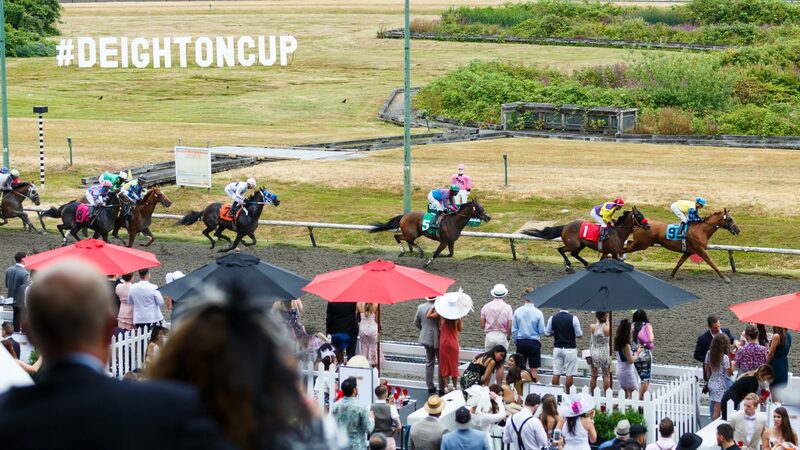 Presented by Parade Agency and The Social Concierge, the 10th Annual Deighton Cup will once again showcase the best of Vancouver food, fashion and fun. 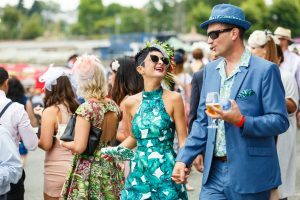 In honour of their banner year, the Deighton Cup has teamed up with some of the city’s top chefs and most popular restaurants. Whether it’s a Santa Fe Chicken Salad from EARLS, tacos from The Pawn Shop, a slow-fired bonanza from Dixie’s BBQ, Aburi sushi from Miku and Minami, or Le Poulet Libanais from the iconic, award-winning Chambar Restaurant, there’s something for every taste. Large groups who opt for a Trackside VIP Booth or Grandstand Box can take advantage of a sumptuous spread prepared by Hawksworth Restaurant. As in past events, guests can expect a full day of exhilarating horse races beginning at 1:15pm, performance and luxury vehicles on display in the Miles End Motors Field of Dreams, the ever-popular Style Stakes Best Dressed competition sponsored by Indochino and CityLux Boutique, the Second Annual “Pearl” Fanny Bay Oyster Shucking Competition paired with Piper-Heidsieck Champagne and more lounges, activities and libations than you can shake a feathered fascinator at. This year, the 6th Annual Cocktail Jockey Mixology Competition, presented by Mount Gay XO Rum, will be held the day before the Deighton Cup, on Friday, July 20 at Prohibition in Hotel Georgia from 12pm to 4pm. Headed by acclaimed Vancouver barkeep Alex Black, the competition will pit the province’s top bartenders against each other in a quest for the ultimate twist on a classic rum punch. The winner gets bragging rights, the coveted Boothby Julep Trophy and a $1,000 cash prize! Partial proceeds from all ticket sales to benefit Variety – the Children’s Charity.